Some call it a natural "high." Others refer to it as being "in a zone." Whatever it`s called, flow is an elusive and very sought-after psychological state that athletes, coaches, and sport psychologists have tried to understand, harness, and employ to their benefit since Mihaly Csikszentmihalyi first coined the term back in the early 1970s. The book begins with a description of what flow is and is not. Flow is defined as a person`s total absorption into an activity. While it is always a peak, satisfying experience, it is not necessarily associated with peak performance on every occasion. Most of the book delves deeply into the key factors leading up to and accompanying the flow experience. The authors also recommend certain actions on the part of the athlete or coach to optimize the conditions in training and performance that allow flow to occur. The book is full of vivid examples, captivating quotes, and revealing research findings that enhance the authors` clear and insightful text. The sport setting is rife with opportunities to experience flow-be it in pick-up games or the Olympics. But until now, flow has been an infrequent, accidental, and even mysterious phenomenon to most athletes. 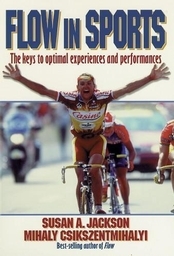 With Flow in Sports, this optimal experience becomes both more familiar and more achievable. Get to know flow, and get into it. Find out what you`ve been missing.